Welcome to our original shoulder bags section. We invite you to explore our offerings featured below. Shoulder Bags There are 25 products. Working with cotton, the artisans craft this shoulder bag by hand. They decorate the body with a colorful band embroidered by Thailand's Yao ethnic minority people and frame it with a labyrinthine pattern. Lined with cotton, the interior has a pocket. The bag closes with a hoop over an elephant button carved from coconut shell. 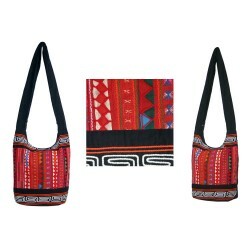 The artisans of Chiang Mai craft this shoulder bag by hand with cotton. They decorate the body with colorful ribbons handmade by Akha ethnic minority women and frame them with a labyrinthine pattern. 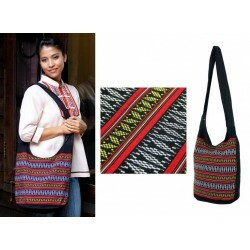 Lined with cotton, the bag has 2 inner pockets and closes with a zipper. 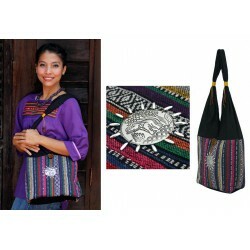 The artisans of Chiang Mai craft this shoulder bag using cotton and polyester. The decoration features a hypnotic white pattern on a blue background. Lined, this versatile accessory hides two convenient pockets in its interior. It closes with a zipper. 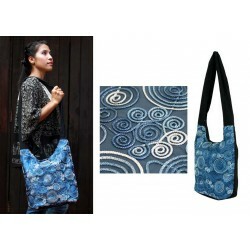 This shoulder bag is handmade with cotton and polyester. The decoration features a hypnotic white pattern on a blue background. Golden cords and rain tree wood beads adorn the strap and the bag fastens with a hoop over an elephant button carved from coconut shell. Lined, this versatile accessory hides a convenient zipped pocket in its interior. 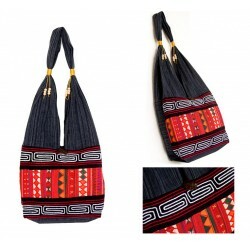 This shoulder bag is handmade from cotton. The artisan uses embroidery, beadwork and sequins to decorate it like a kalaga - a traditional Burmese wall hanging. Golden cords and rain tree wood beads adorn the strap, and the bag closes with a hoop over a coconut shell button. The bag features an inner pocket with zipper. 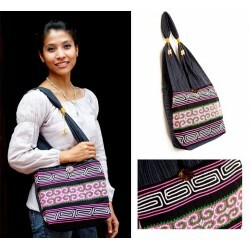 Chiang Mai artisans craft this shoulder bag by hand with cotton. They decorate it with geometric motifs woven by hand. Lined with cotton, the interior features two inner pockets. It closes with a zipper. 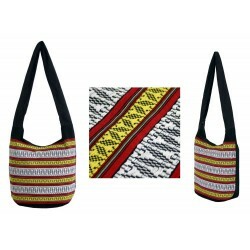 This shoulder bag is handcrafted with cotton. The artisan decorates it with geometric motifs woven by hand. 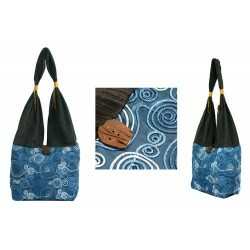 Fully lined with cotton, this versatile bag features two inner pockets. It closes with a zipper. The artisans craft this cotton shoulder bag by hand. The top and bottom labyrinthine motifs frame elephants and vegetation woven into a gold and pink ribbon. The bag closes with a hoop over a flower button carved from coconut shell. The interior is fully lined with cotton and has two pockets. 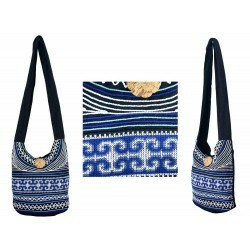 This cotton shoulder bag is handmade by the artisans of Chiang Mai. 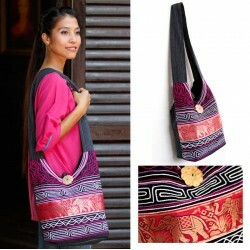 The bag body features a colorful textile and an elephant engraved on a aluminum medallion. Golden cords and rain tree wood beads adorn the strap, while the bag fastens with a hoop over an elephant button carved from coconut shell. The bag hides a pocket with zipper in the inside.